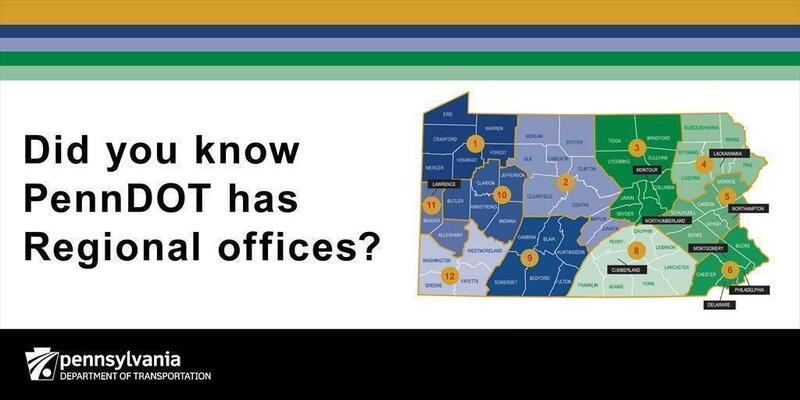 Did you know PennDOT has Regional Offices? The Pennsylvania Department of Transportation has 11 regional offices, also known as districts. Each regional office/district covers certain Pennsylvania counties and oversees programs and policies affecting highways, urban and rural public transportation, airports, railroads, ports, and waterways. PennDOT has a whole is directly responsible for nearly 40,000 miles of highway and roughly 25,000 bridges, a system first established in 1911. To find out where your local PennDOT District is located visit http://www.penndot.gov/RegionalOffices/Pages/default.aspx or scroll below. PennDOT's Engineering District 1 is responsible for the state-maintained transportation network in this region. This includes over 3,600 road miles and over 2,000 bridges. PennDOT's Engineering District 2 is responsible for the state-maintained transportation network in this region. This includes 3,731 total road miles and 2,188 total bridges. PennDOT's Engineering District 3 is responsible for the state-maintained transportation network in this region. This includes 4,500 total road miles and 2,901 total bridges. PennDOT's Engineering District 4 is responsible for the state-maintained transportation network in this region. This includes 3,932 total road miles and 2,090 total bridges. PennDOT's Engineering District 5 is responsible for the state-maintained transportation network in this region. This includes 3,344 total road miles and 2,128 total bridges. PennDOT's Engineering District 6 is responsible for the state-maintained transportation network in this region. This includes 3,562 total road miles and 2,767 total bridges. PennDOT's Engineering District 9 is responsible for the state-maintained transportation network in this region. This includes 3,993 total road miles and 2,084 state bridges. PennDOT's Engineering District 10 is responsible for the state-maintained transportation network in this region. This includes 3,180 total road miles and 1,630 total bridges. PennDOT's Engineering District 12 is responsible for the state-maintained transportation network in this region. This includes 3,627 total road miles and 2,339 total bridges. For more PennDOT information, visit www.penndot.gov. Follow PennDOT on Facebook, Twitter, and Instagram.